Habitat: The plant is native to Europe, Northern and Western Asia and North America. It grows well on moist and chalky soils, on Alpine and sub-alpine meadows with frequent snow periods. 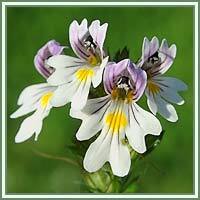 Description: Eyebright is a creeping, herbaceous, semi-parasitic plant. It has square, branchy stems and round to pointed leaves. The plant is in flower from July to September. Flowers are small, white to purple, with numerous spots and stripes on the surface. They are borne in spikes from the upper leaves. Useful components: Iridoid glycosides, flavonoids, bitters, essential and volatile oils, phenolic acids, several B vitamins, vitamins A, C, D and E and tannins. Medicinal use: Eyebright has anti-inflammatory, antibiotic, antioxidant and astringent properties. 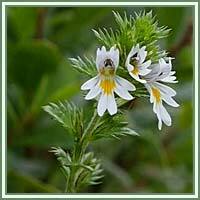 As its name suggests, Eyebright is an excellent remedy for different sorts of eye problems. It can tighten the mucous membranes around the eyes, fighting free-radical damage, and can therefore be extremely helpful in cases of infectious and allergic reactions afflicting eyes. Disorders like conjunctivitis and blepharitis are easily reduced with Eyebright. Its astringent properties are excellent for reduction of excessive mucus, associated with colds, sinusitis, problems with middle ear and upper respiratory conditions.